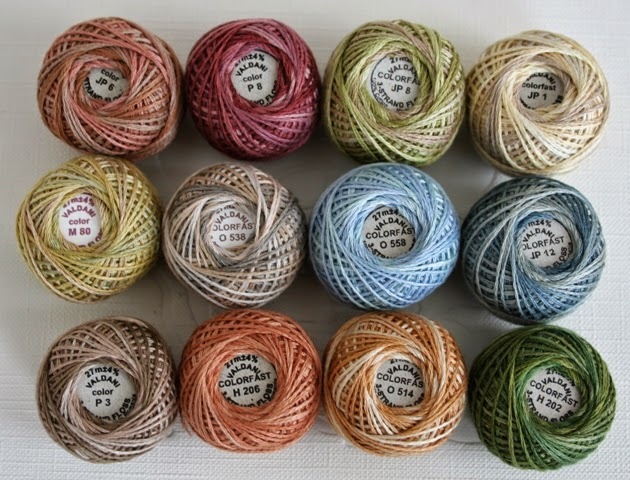 Sneaky Peeky and Floss Sale! Hi ya! I hope you had a fun weekend! 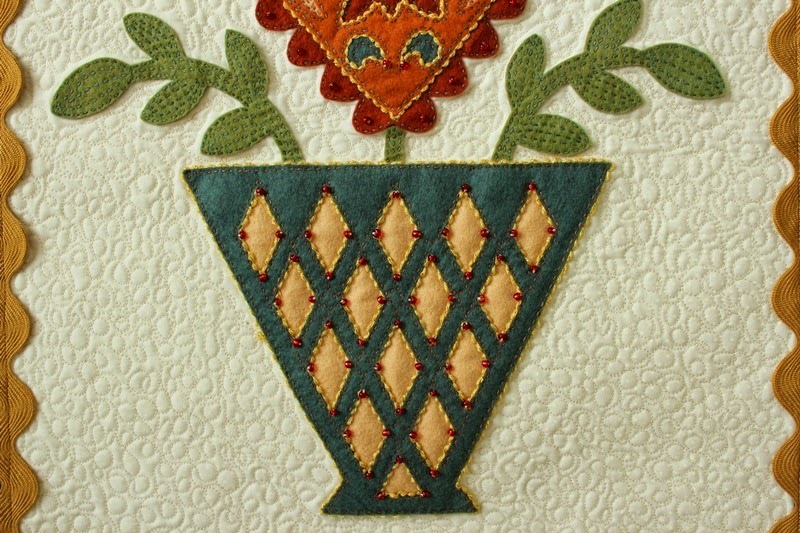 Today I wanted to give you a sneaky peeky of my new Folk Art Fusion pattern "The May Basket." 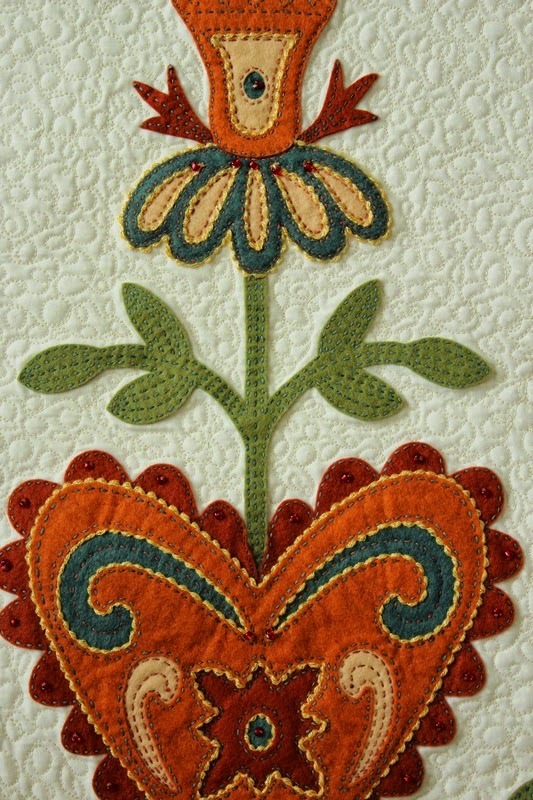 It's got hand stitching, embellishments and machine quilting. 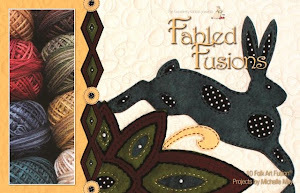 I know you will love making this wall hanging. The pattern will be available in my Craftsy Shop, this Friday, July 4th. I will have wool felt and floss kits available in my Web Shop. Also on Friday, I'm having a huge Summer Stitchin Stock Up Floss Sale! (say that three times fast, hee,hee,hee) All my Valdani 3 strand, colorfast floss will be on sale. Regular price is $3.60 a ball. Sale price will be $3.00 a ball! So be sure and hop back to visit us on Friday! Hoppy Friday! Lindsey Stirling in concert. This is Lindsey's original song, "Beyond the Veil" from her new album. I just love it. Here is our Week 26 Flower. Remember, all remaining flowers will be for the final project in December. It was fun to do the stitching on this one. Twenty six weeks so far and every flower looks different. You can join the Fellowship anytime. Click on the tab at the top of my blog for all the information. So onto the show and tell. First, I want to share this incredible quilt Suzanne made for her grandy daughter. I loooooooooooooooooooove it! This is the fabric she put on the back. 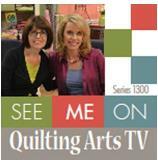 Vicki, our President, is a longarmer and did the quilting. Such a stunning quilt. and this one is the back side of the one above. She made reversible. Cool! Sandy made this fun quilt. I looooooooooove that green polka dot fabric! She also made this log cabin. Barbara made this quilt for a grandy daughter who just got married. Totally modern. I can picture this quilted to the hilt and on the cover of Modern Quilt Magazine with those fabulous colors. Barbara was quick like a bunny this month, so I had a hard time getting photos. This was a cute hexi quilt. and a cute tote bag with rope handles. Great for the beach! and this one. She said she has now used up all her critter blocks from the block swap. Mary Kay and Marianne own a local frame shop. (For any of my local friends, I will be the featured artist in their shop, Ballantyne Framing, on July 11 for Art Walk. Hop by to see me!) The girls gave a presentation on framing quilts and pieces from old or damaged quilts. They talked about how you can add different mats and frames and how these pieces will be preserved. Marianne showed how this family heirloom was damaged in a fire, but was able to be made into a framed piece of art for the family to continue to enjoy and treasure. Recently, I've been toying with the idea of framing some of my art quilts. What are your thoughts on that? Do you like framed quilts or do you like them unframed? One final note, I want to send Renee (goddess of the pistachio fluff stuff) a big hug. Her aunt Norma, who I featured in post a while back, became an angel the other week at age 99. She passed on 23 years to the day of her husband becoming an angel. She was in her own home, in her own bed and simply went to sleep. I can't imagine a more beautiful and peaceful way to go. It gave me goosebumps when she told me. Hoppy Friday! Did you have a good week? This week I'm grateful for fresh veggies and friends who grow them. I went to my guild meeting the other night and Bonnie brought lots of veggies from her garden. Some of the gals took a few, but there were all of these left. Bonnie said, "Michelle, I trust you will take the rest?" Oh yeah! Happy bunny dance! Sometimes, I feel like me and ivy have a really good friendship going on. I trim it back and shove the clippings in a glass of water and voila', I have another ivy plant. Everything else I try to grow gives me the ole' stink eye and then croaks. I have a Gerber daisy plant on the back porch now...it's life expectancy fluctuates from day to day. hee,hee,hee. So a big "THANK YOU" to all the fabulous friends, family and farmers who know how to grow the bestest stuff ever and thank you ivy for saving me from feeling like a plant serial killer! Well, we're half way through! Can you believe it? Remember, if you click the tab at the top of my blog, you can look back through all the flowers and projects so far. This week the rose returns. This is how it looked before I stitched it. Again, all remaining flowers will be for the final project in December. This week I used a red, white and blue theme. It's hard to tell from the photos, but that is a navy colored yarn. This color scheme reminds me of a bandana and summer picnics. Have you had any picnics yet? Hi ya! 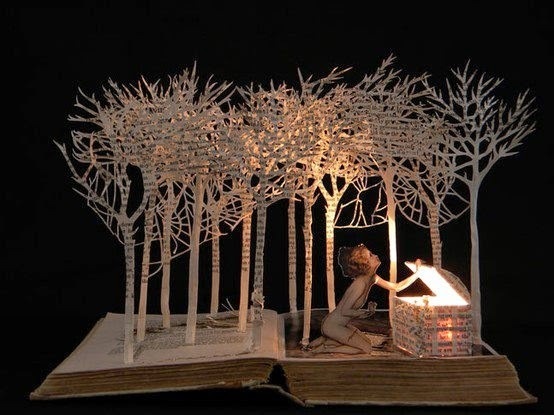 Today I wanted to share something I find to be truly enchanting. Like many people my age and older, I still have a huge fondness for books. 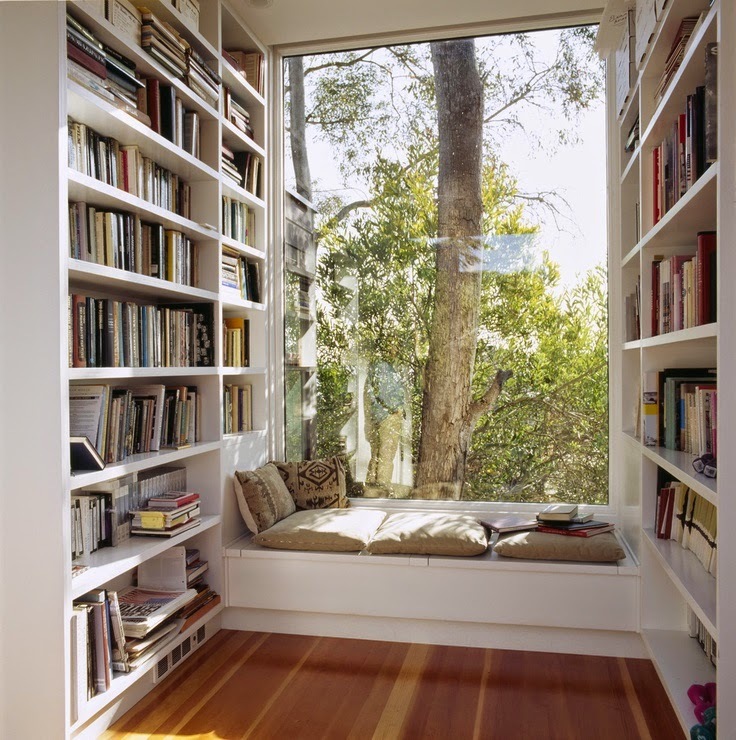 "The love of learning, the sequestered nooks, and all the sweet serenity of books." The other day, my friend, Lydia and I were talking about the first time we went to a library and got our library card. It was so magical. 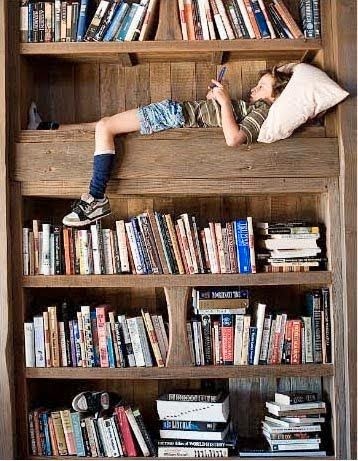 Growing up as a poor kid, the library was the best place on earth! I could get anything I wanted and it was FREE! Rows upon rows upon rows of anything I wanted to read. I remember one librarian questioning my choice in books. She said, "Those are a little old for you don't you think?" They were books on butterflies and animals and science. I guess it did seem odd for 6 year old to want these books, but I didn't care. I got them anyway! Now today, while I do enjoy my magazines in digital format, there are many books in my collection that I will NEVER part with. 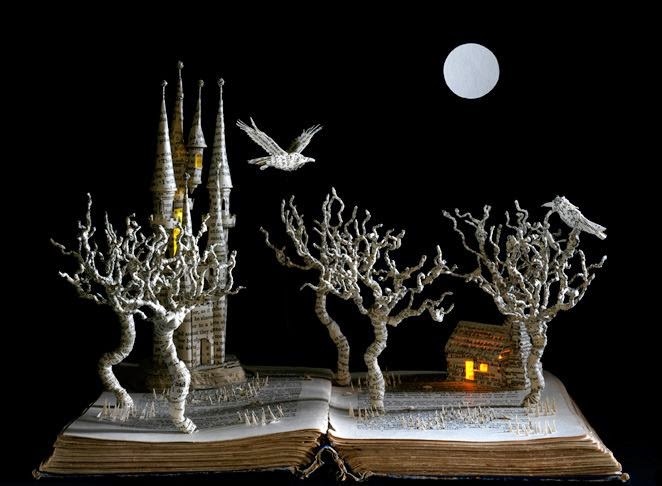 I collect classic stories, wonderful children's books and a variety of educational and "coffee table" books. I can't imagine my life without them. I love the feel of the pages and the smell of the paper. I love being transported to a magical place. Unfortunately, as we hop gallop full speed ahead into the digital age, many books are being tossed aside and forgotten about as we, especially teenagers and kids, read from computers, tablets and phones. However sometimes, just like for people, there is an opportunity to be reinvented. Sometimes all it takes is a someone who can look at things with a different perspective. A person who can still see the beauty and magic that exists in everything, but can give it a new purpose, a fresh start, a new light. 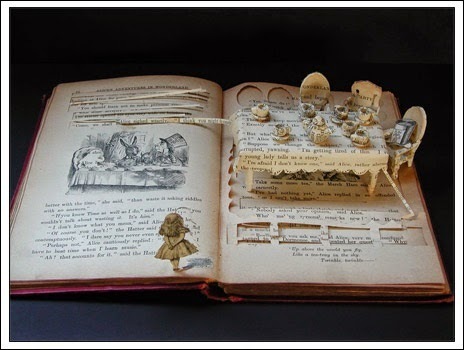 I would like to introduce book artist, Su Blackwell. I found Su's work a few years ago and was mesmerized by her talent. 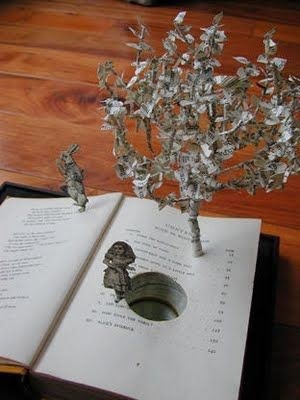 She takes second hand, discarded books and turns them into art, which can once again be loved and enjoyed. Even though, the stories within their pages are now read digitally, Su pulls the magic from the actual pages. 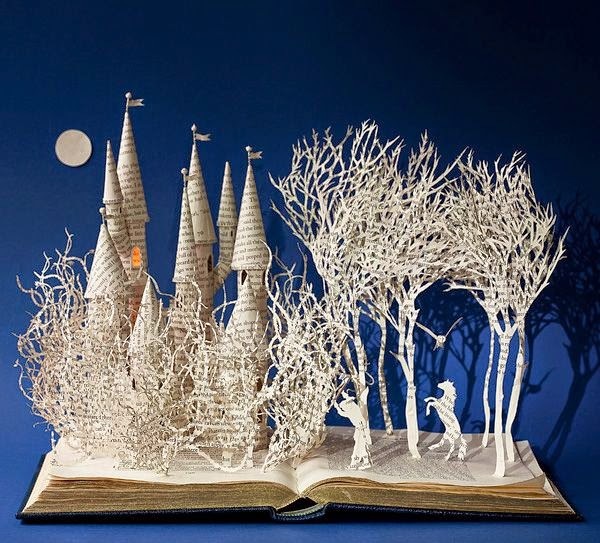 It is so beautiful and enchanting. 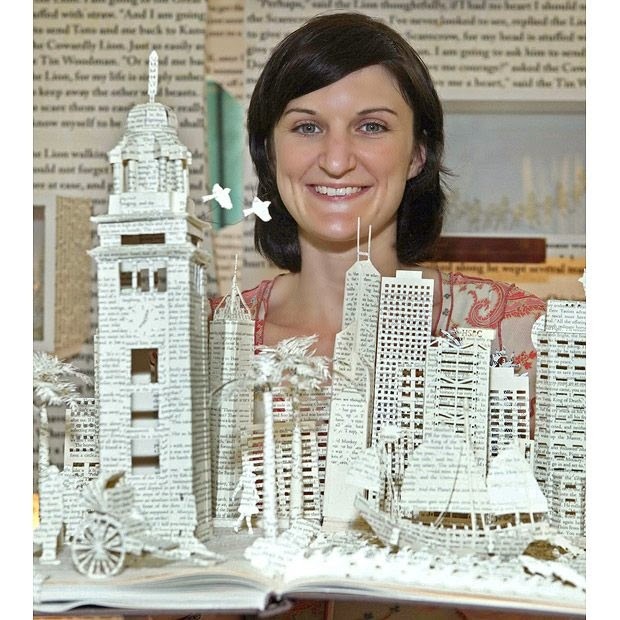 and countless other projects with her book art. Here is a wonderful video showcasing a piece she did for Crabtree and Evelyn. I think you will enjoy it very much. There comes a time for everything when you fall down a rabbit hole and are forced to reinvent yourself. If not, you will be tossed aside, discarded and forgotten about. The world evolves. It's just as simple as that. Hugs and a most happy start to your week. Honestly, I can't believe it's Friday again. I have found that working for myself, Friday's don't have the same feeling as they use to. That "Thank God it's Friday" feeling has turned into "Oh my gosh! Where did this week go? It's Friday already!!!!" This week I would like to share two stories that touched my heart, made me smile and made me cry happy tears. First was Mama turtle. Every morning when I get up, I open my bathroom window blind, look into my back yard at the pond, the trees, the grass and the sky and say out loud, "Thank you for this day!" The other morning, my day started out watching Mama turtle head up my yard to my flower bed. David had just put fresh mulch in all the beds. Mama turtle got into the bed, dug her head under the mulch, turned in a circle three times and the started to dig with her back legs. She's an older turtle as noted by all the moss on her shell. I was so excited as I knew she was going to plant eggs there. I call it planting because they really do plant them in the earth. It took her about 40 minutes to dig the hole (I fed the bunnies and had coffee while she was digging). Then she straddled the hole and plop, in went an egg! She pushed a little dirt on the egg and then again, plop went another egg and some dirt and again and again. She planted a total of five eggs! Then just as carefully as she made the circle, she covered it back up. I watched her travel back down the yard to the safety of the pond. Quickly, I went to my computer and Googled how long it would take for the babies of a Slider turtle to hatch. Looks like 45-90 days depending on weather conditions. What touched my heart most is the place she decided to plant the eggs. You see, new life will be coming from a place where I buried four of my beloved bunnies. This place is a bunny graveyard. I can't help but think these wee turtles will be safe here. I'll be keeping a watchful eye on this spot for sure and give those babies a first class flight to the pond once they emerge. Next, I had an unexpected gift from my mailman. Literally, a gift from the mailman. His name is Adriane. If I see him getting a package out of his truck for me, I will walk out to greet him and save his tired legs a walk up my driveway. The other week he said, "I've been meaning to ask you something. My mother passed away a few years ago and she was really into ceramics. 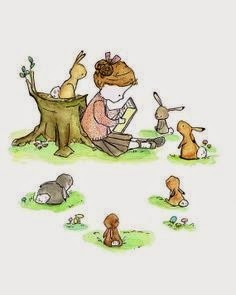 She made three white rabbits. I was wondering if you might like them?" The three hares, whom I have named "Wynken, Blynken and Nod have found a new home on the shelf in my guest room. Here they will watch over my guests as they sleep and bring them sweet dreams. Each was signed by Adriane's mother and dated 1997. I can't help but think she is happy and smiling that a crazy bunny lady ended up with her creations. hee,hee,hee. Here is the poem Wynken, Blynken and Nod written by American writer, Eugene Field. It's original title was a Dutch lullaby published, March 9, 1889. It is one of my mom's favorites and mine too. Hugs, hoppy Friday and may your weekend be filled with many things to be grateful for. Hoppy Friday and the Winner is!